This section provides status overviews by type of programmes involving aircraft that are currently being delivered or projects for which funding is being sought. A table at the end of Aircraft Programmes, above the Aircraft Projects section, provides the in-service years and numbers received or on order of JGSDF aircraft types in chronological order. The budget system employed by the Japan Ministry of Defense calls for equipment requests for the following fiscal year to be submitted to the government in August and approved in December. The fiscal year runs from April 1 of that year to March 31 of the following year. For the purposes of longer term planning, the Cabinet approves a five-year Medium-Term Defense Program (MTDP). Passed on December 17, 2013, the current MTDP runs from FY2014 to FY2018. Then officially listed as the “next helicopter trainer,” the single-aircraft first buy of what was to be the Enstrom 480B (given the Japanese military designation TH-480B) was included in the fiscal 2009 budget. The aircraft was delivered in February 2011. Another single aircraft was included in fiscal 2010 before capital sanction was acquired for the bulk procurement of an additional 28 helicopters in fiscal 2011. Purchased by the Chinese company Chongqing Helicopter Investment Co., Ltd. (CQHIC) in late 2012, the Enstrom Helicopter Corp. has successfully completed the contract. The last of the total of 30 aircraft was test flown at the JAMCO Corporation facility at Sendai in early February 2015. The 80th JGSDF Chinook when CH-47J procurement is included, the 30th CH-47JA first flew on January 16, 2014. The 32nd CH-47JA was being flight tested in late September 2015. Rather than new aircraft, the unsuccessful FY2015 budget request included funding for the “restoration” of three CH-47J helicopters, one of which had been agreed to in the two previous fiscal years. On January 17, 2015, it was announced that the JGSDF plans to base four CH-47Js and 100 support personnel at a sub-base co-located with JASDF Miho, Tottori Prefecture, from fiscal 2017/18. The Japan Ministry of Defense announced on December 18, 2015, that funding for an additional CH-47JA funding would be earmarked under the fiscal 2015 supplementary budget to provide enhanced cover for disaster relief. Despite the inclusion of big-ticket V-22 tilt rotors in the fiscal 2017 budget request announced as usual in August 2016, the JGSDF successfully sought the bulk purchase of the six new CH-47JAs listed in the MTDP under FY2017 funding; the first three aircraft are expected to be delivered in fiscal 2021, the remaining three in fiscal 2022. Whereas previous aircraft have been equivalent to the U.S. Army’s CH-47D specification, these six will switch to the CH-47F variant. On January 17, 2017, KHI delivered its 100th Chinook, a JGSDF CH-47JA. Since 1986, the JGSDF has received 69 of those 100 aircraft, the JASDF the remaining 31. The JGSDF is also planning to bolster its heavy-lift capabilities in the Osaka area by adding a Chinook-equipped 3rd Flight to the Central Region Helicopter Squadron. (*) Additional aircraft funded from supplementary budget. (**) Funding was one “restoration” in each of fiscal 2013 and 2014. Notes: (FY2015) No main budget funding received for three aircraft requested; funding for one additional aircraft under supplementary budget. The last of the 39 helicopters of this type budgeted for between fiscal years 1995 and 2013 was being test flown at Nagoya in January 2016. The pattern of acquisition in recent years is shown in the chart below. The Japan Ministry of Defense announced on December 18, 2015, that additional UH-60JAs would be procured under the fiscal 2015 supplementary budget as part of funding earmarked to provide enhanced cover for disaster relief. The Japan Ministry of Defense announced its selection of the V-22 Osprey on November 21, 2014. The MTDP foresees the introduction of 17 tilt-rotor aircraft in connection with the formation of an amphibious, rapid deployment brigade. Although not specified at the time of the MTDP’s announcement, all the signs since then left little doubt that the Osprey would be selected. In the end, the defence budget announced on January 14, 2015, included funding for an initial buy of five of the type. This has been followed by the approval of four of the additional 12 requested as part of the fiscal 2016 budget. Not surprisingly, the 1.32 billion yen originally allocated was the only funding earmarked for JGSDF aircraft purchases. There is a sense of irony that the Osprey, which has found itself caught in the downwash of controversy concerning the U.S. military presence in Okinawa in particular, will be entering the JGSDF’s ranks. In July 2012, the USMC deployed an Osprey unit to MCAS Futenma via Iwakuni, Yamaguchi Prefecture. Due to its initially poor safety record, the Osprey became the subject of at times vociferous local protest even before its arrival at Futenma, where a USMC CH-53D had crashed onto a university campus, fortunately outside of term time, in 2004. Accidents involving a U.S. Air Force HH-60G Pave Hawk in Okinawa and an U. S. Navy MH-60S Knighthawk close to Yokosuka naval base, in August and December 2013, respectively, provided the opposition’s argument with extra ammunition. In July 2014, the Osprey thus made its charm offensive debut in Tokyo when a pair of USMC aircraft stopped at Yokota AB en route to static display at an air show in Sapporo, Hokkaido Prefecture. In August, Ospreys were back at Yokota AB to take part in a disaster relief drill and, amid more protests in mid-October, in a tsunami response exercise in Wakayama Prefecture, during which they were operated without incident from the JMSDF helicopter carrier Ise. The first demonstration flight of an Osprey at an air show in Japan was at Nyutabaru air base, Miyazaki Prefecture, in December 2013. During a visit to the United States in July 2014, the then Japanese Defence Minister Itsunori Onodera arrived at the Pentagon aboard an Osprey operated by the presidential support flight, and not for nothing was an Osprey present when Prime Minister Shinzo Abe visited Hyakuri AB for the SDF review in October. At the grass roots level, JGSDF troops have already been airlifted by Ospreys during joint exercises, as shown in the photograph from October 2013 below. The December 2014 issue of JWings magazine quotes U.S. data from 2012 released by the Japanese Ministry of Defense. The data shows that the USMC’s MV-22B’s accident rate was better than other USMC types, including the CH-46E Sea Knight the Osprey has replaced at Futenma, and the accident rate for Japanese civil-operated helicopters. Hand in hand with the prospect of the JGSDF operating the Osprey come the added considerations and expense of the development of dedicated air base and support facilities for the amphibious brigade. The USMC has made use of underutilized Saga airport in northern Kyushu for training and ferry purposes, but a Japanese suggestion to ultimately co-locate both services’ Ospreys there was dismissed as operationally impractical by the U.S. side in August 2014. Soon afterwards, buoys off Camp Schwab in Okinawa marked out an area that, when reclaimed, is set to ultimately become the site of a new USMC air base. Although seemingly a step toward easing the burden on the residents around Futenma, this plan has also come up against opposition on environmental grounds and been firmly in the sights of the staunchly anti-base Governor of Okinawa Takeshi Onaga, who was voted in on November 16 and assumed office on December 10, 2014. The details of the JGSDF’s Osprey eyrie are yet to be ironed out, but the first base to receive an example when deliveries of the type commence in September 2017 will presumably be the Experimental Flying Unit at Akeno, Mie Prefecture. Published in January, the March 2016 issue of Kōkū Fan mentions that the JGSDF still has plans to base 20 Ospreys at Saga airport, along with the around 50 helicopters currently at nearby Metabaru. It remains to be seen how JGSDF operations would be dovetailed with those of what, following a ceremony held on January 16, 2016, is now the renamed Kyushu Saga International Airport. The increased emergency airlift capability that the Osprey will provide the JGSDF, not to mention on occasion sections of the Japanese population, was ably demonstrated in November 2013. Futenma-based MV-22B Ospreys were able to fly non-stop with heavy loads of all-important initial relief supplies to the area of the Philippines left devastated by Typhoon Haiyan. On February 1, 2017, the U.S. Marine Corps announced that the first JGSDF pilot had commenced training on the Osprey with VMMT-204 at MCAS New River, North Carolina. In due course, Captain Tomohiro Sato (first name to be confirmed) will be an instructor pilot with the unit that is still scheduled to form at an as yet unnamed JGSDF camp at Saga Airport in fiscal 2018. 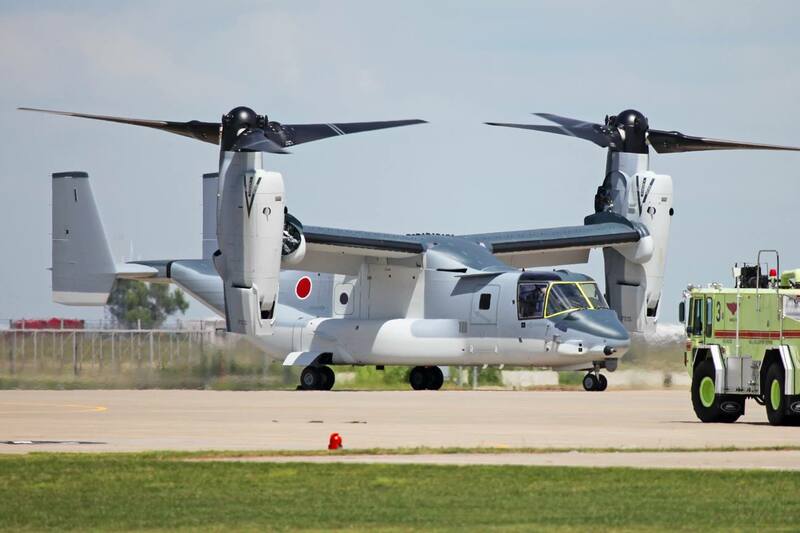 Fast forward to late August 2017, and the first Osprey destined for the JGSDF, a V-22B Block C aircraft equivalent to the USMC’s MV-22, was sighted at the Bell Helicopter Assembly Center in Amarillo, Texas, shortly before its first flight [link]. Also in August, Japanese news media were reporting that opposition to Ospreys being operated from Saga airport—primarily from the fishing cooperative that owns the land earmarked for development—might dictate that the much-maligned aircraft be assigned to a JGSDF camp in Kyushu instead. Although any decision is still very much up in the air, Kyushu would be preferable to the fallback plan of the far-off but wide-open spaces of Kisarazu on the coast of Chiba Prefecture. In contrast to the speed of the TH-480B deliveries, the JGSDF has been drip fed 130 UH-1Js since 1993, continuing a process that was started with the first of 90 now long since retired UH-1Bs in 1963 and followed with the first of 133 UH-1Hs in 1973. At the end of March 2014, the Ministry of Defense stated that its combined UH-1H/J inventory stood at some 141 helicopters; some UH-1Hs remain in store or are used as instructional airframes. That gives you some idea of the numbers of helicopters involved in this requirement. Had things been different, the JGSDF would have been looking ahead to accepting delivery of the first UH-X in 2017, as Kawasaki Heavy Industries (KHI) was awarded a contract in March 2012. At that time, an artist’s impression of Kawasaki’s winning design revealed a standard UH-1J-class utility helicopter configuration for two crew and 11 personnel, with certain design elements—side-mounted engine intakes, Fenestron tail rotor—adopted from the company’s OH-1. All was left in the hover in 2013, however, after it transpired that JGSDF officials had leaked bid information to KHI. The only other company in contention had been Fuji Heavy Industries (FHI), the JGSDF’s 40-year legacy provider of the three UH-1 variants. This time around, the early indications were that a wide-open field would be entered in the race to win the development contract and a decade’s worth of deliveries valued at around $2 billion. Lined up waiting for the issuance of a formal request for proposals were teams of Japanese and overseas manufacturers, the Ministry of Defense having announced in April 2014 its plans to select a modified, commercially available helicopter to fulfill the requirement. On February 25, 2015, the Equipment Procurement and Construction Office at the Ministry of Defense issued a synopsis of the request for proposal guidelines for those companies wishing to bid for the UH-X contract. This called for one helicopter to have been delivered by March 30, 2020. A briefing for interested parties was scheduled for March 9, and the deadline for manufacturer’s proposals set at June 2. An old adage once said that the only replacement for a DC-3 is another DC-3. In the helicopter world, Bell Helicopter Corp. and FHI was proved correct in hoping that the Japan Ministry of Defense would think that could be said of Hueys as well; the Bell 412EPI was selected as the base airframe in July 2015. The Bell 412 and 412EP are well represented in the skies over Japan, including with the Japan Coast Guard and prefectural rescue services (photo below). First introduced onto the market in March 2013, the latest 412EPI version offers equipment fit and performance improvements. In recent years, European companies have made deep inroads into the Japanese helicopter market. One such is AgustaWestland, which secured Japan Coast Guard orders for its AW139 with the assistance of its distributor, the trading company Mitsui & Co., rather than a Japanese manufacturer. On paper an ideal fit in this case would have been the AW169, the prototype of which (see photo below) first flew in May 2012, coincidentally soon after the failed first contract was placed with KHI. KHI had been set to team up with Airbus Helicopters, which as Eurocopter recorded a volume of orders in the Japanese market sufficient for the setting up of a dedicated maintenance facility in Kobe, Hyogo Prefecture. Trumpeted as a “clean-sheet” design, the partnership’s submission would nonetheless have drawn on Airbus Helicopters’ newly developed H160 platform rather than the militarized version of its EC145 that was selected from among five proposals by the U. S. Army as the UH-72A Lakota. In the final analysis, the Bell 412EPI-based helicopter won out in terms of its assessment under the requirement’s performance, logistical support, development feasibility and delivery lead time criteria. The first of around 150 aircraft is due to enter service in 2021. The March 2019 issue of Kōkū Fan reported that the first UH-X (45001) had hovered for the first time on December 21, 2018, and first flown four days later, on Christmas Day. An initial buy of six was included in the 2019 budget. Planned for inclusion over the long term, this section will focus on the design, development, and operation (including pilot perspectives) of the indigenous types utilized by the JGSDF over the years. These will include the Mitsubishi LR-1 liaison aircraft, which was based on the civil Mitsubishi MU-2, and Kawasaki OH-1 attack helicopter. Later on, the emphasis will switch to include foreign aircraft types—primarily helicopters, ranging from the Bell H-13 to the Boeing-Vertol CH-47 Chinook—that the Japanese aviation industry has built for JGSDF service. Production of the Kawasaki OH-1 ended with the delivery of the 38th and final example on Feb. 26, 2013.
grounded for more than three years; the flight ban was finally lifted in March 2019.
old name for modern-day Chiba Prefecture, where the unit is based. in 1984, the type was gradually replaced by the LR-2—a version of the Raytheon King Air 350. The last remaining LR-1 was withdrawn from service after its final flight, on February 15, 2016.
sister aircraft and placed on display at Naha.